Your outdoor photos shared with Montana Untamed. Jim Gustafson, of Helena, was fishing with friends when he pulled this 18-pound pike through the ice at Hell Creek on Fort Peck Reservoir on Jan. 5. It was the biggest pike he's ever landed. 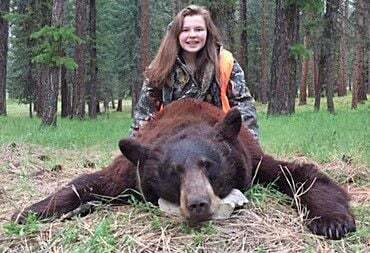 Aubrie Zohner, 15, of Frenchtown, shot this 5.5-foot black bear on May 25, 2017, while hunting in the Missoula area with her father, Dave Zohner. Aubrie Zohner, 15, of Frenchtown, shot this whitetail buck on Nov. 12 while hunting in the Frenchtown area with her father, Dave Zohner. Chase White, 10, from Butte, shot his first three point mule deer buck while hunting with Dustin French in the Cardwell area. He used a Winchester .243 rifle. Chase White, 10, from Butte, shot his first deer while hunting with his father, Scott White. Chase was hunting near Glen with a Winchester .308. Cassi Olson, of Billings, was hunting in Eastern Montana this past season when she bagged her first buck. Helena resident Tom Kilmer shot this photo of Wilder Creek while snowshoeing on Feb. 7 on national forest land near Bernice, southwest of Basin.